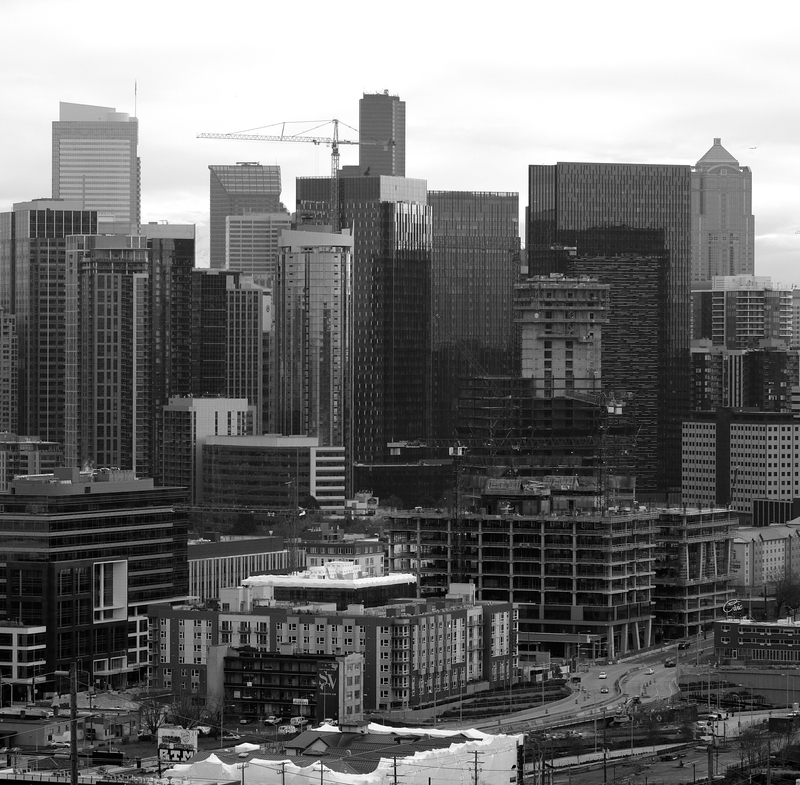 For the past more than a decade Seattle has been suffering under a constant construction boom. If you don’t like cranes in your skyline photos, good luck finding an angle to avoid them. In this photo almost all of the buildings you can see are new, and at least four are under construction. Many of our most distinctive looking buildings are now surrounded by others, hiding them. The roadway is under construction for the new tunnel too. The Seattle skyline is almost unrecognizable compared to what it was twenty years ago, and tall buildings keep creeping ever closer to the Space Needle so that our icon doesn’t stand out as clearly anymore. Driving through the South Lake Union area is like driving through a completely different city from what it was, with only the street names still the same. I don’t like it. I feel very grumpy about all of it. CB&W = anything construction related. My cousin lives in Seattle and the housing boom keeps pricing her out of the neighborhoods where she has lived. She has moved a lot. Yeah, the housing situation for anyone without a high paying job is terrible. Luckily I bought my condo back in 1995 when you could still find something affordable as long as you didn’t want to live in the more desireable neighborhoods..
That is exactly what she said although she has never been an owner and so she has been priced out of neighborhoods many times. Yes, we always have the most cranes of any city in the country. But you can still get a great view of the skyline from Alki, even though the Space Needle does seem to be shrinking! Yeah. I keep trying to get myself pumped up to do previews for the West Seattle parks, including Alki, but it’s a crummy drive from north Seattle and will involve several trips. So I keep procrastinating. Within the last few weeks I saw someone post a 10 Year Challenge comparison of the skyline shot from Alki. 2008 vs. 2018. The differences between the two were shocking. I’m grumpy too. Rarely leave West Seattle anymore, even though I used to love to take the bus downtown and just walk around. I know what you mean! When I lived in the CD it was very convenient from my house to take a bus downtown, but I don’t like doing it from here. From West Seattle that’s quite a trip. A few weeks ago I drove on the new Mercer Street and wow are things different down there!